Bajaj says that commuter motorcycles, auto rickshaws and small cars all perform adequately in the city, but they’re not perfect. So, while the Qute is clearly neither of them, it does borrow from all of them. The small motorcycle-sized engine gives it great mileage - Bajaj claims 36kmpl from petrol and 45km/kg from CNG. Like an auto, it’s still basic people transport and so it’s relatively inexpensive and cheap to maintain - Baja Claim as little as Rs 1.53 per kilometer. And it borrows the stability and the obvious protection of four doors and four wheels from a regular car. So it can legally carry more people than a motorcycle and is more weather proof and stable than an auto. But with no AC or even a blower, and the fact that it’s confined to city limits, it’s not as free roaming as a car either. Is it cute? The Qute actually looks quite conventional. Its face is not unpleasant, with two large halogen headlamps and a large chrome Qute logo between them. Beneath that is a grill that borrows some more tech from the motorcycle world. It uses the ram air principle (used in performance motorcycles like the ZX10R and the BMW S1000RR to make more power) to force air up the A-pillar and into the cabin or onto the windshield for better ventilation. The bonnet opens to reveal a 77-litre storage area for shopping or a small bag, but it’s subject to a 20kg weight limit. On the side, you’ll notice that Bajaj has taken efforts to give the shoulder a characterful slope even though the sliding windows would have been easier to execute with a straight horizontal window line. The plastic cladding just below the window hides another secret - more vents. Since the Qute doesn’t have an aircon or even a blower, it needs all the ventilation it can get. So below all four windows, there are cleverly designed vents that will let air in when the Qute is moving. In theory, it will allow occupants to have the windows closed during the monsoons without it getting too stuffy inside. Bajaj has even sculpted the two ORVMs to further direct more air into the cabin when the windows are opened. At the rear, there are two simple taillights flanking another Qute logo and a hatch that opens to reveal the engine. On the inside, things are similarly sparse but surprisingly roomy. Only the driver’s seat slides back and forth, while the rest are fixed in place. The seat backs don’t recline either, on all seats. But it will easily fit four full-sized adults. The rear seats have a 40-60 split and fold down to reveal a small 40-litre storage area that can store two small backpacks. With the seats folded down, the rear cargo area grows to a healthy 400 litres. At the front, the driving position is fairly comfortable and that’s good because the steering position is fixed. On the dash, there are two more lockable cubby holes on either side that can store papers, mobiles and small knick-knacks. There are also two storage compartments on the doors; one for smaller items like your phone, while the lower space holds larger items like 1-litre bottles. But these storage areas are not segmented. So, if you do place a bottle inside and there’s nothing else in there to support it, it will rattle about when you get going. You even get a small FM radio which also has support for USB and AUX with two speakers mounted under the dash that sound ok-ish. So overall, while it is a basic space to spend time in, it has some nice practical touches to it. The Qute is powered by a 216.6cc, single-cylinder, liquid-cooled, DTS-i engine that makes 13PS@5500rpm and 19Nm@4000rpm, which is the most powerful configuration. The Qute also comes in a CNG variant, like the one we had on test, and this makes 11PS and 16Nm. It does not have a flexi-fuel option, so you have to choose which fuel you want to use at the outset. The engine drives the rear wheels via a 5-speed sequential gearbox. This means that like a motorcycle gearbox, you have to shift up through the gears one by one in sequence and you can’t skip ratios like with an H-pattern shift box. The Qute runs on 135/70 R12 steel wheels with drum brakes on all four. As soon as you start turning the wheels to pull out of a parking spot, you’ll notice that there’s no power steering. Not because the steering itself is very heavy, but it’s weighty enough for you to realise that there’s no assistance. On the move though, it quickly becomes completely manageable and is actually light enough for regular city use. To add a little perspective, for those who can remember, it’s much lighter than the non-powered rack of the old Maruti 800. And it should be - its size and weight (456kg) make even the tiny 800 look large. The steering does get lighter as speeds increase, but stays composed right up to the Qute’s limited 70kmph top speed. The Qute is actually quite nice to drive in the city and it can make quick lane changes and start and stop in a very agile fashion. Even the suspension is surprisingly accommodating. It’s much more comfortable than an auto and a lot more comfortable than even some entry-level cars too. A good deal of credit goes to the fully independent suspension setup on all four corners of the Qute. The next thing you will notice is that it’s quite loud inside the cabin with the motor sitting under the rear seats, filling the tiny cabin with a constant drone that increases as the revs rise. It seems even louder than an autorickshaw which Bajaj had on hand for us to drive before we stepped into the Cute. So, that is something that you will have to get used to. The engine and five-speed gearbox combination is adequate for the city. The ratios are fairly short, so you do have to keep shifting through the gears, but the sequential gearbox is nice and slick. We even managed some city driving with three ZigWheels heavyweights (total weight 273kg) inside the cabin. So, even with a full load (350kg), the engine’s pulling capacity should be more than adequate. At 38 degrees, the day of our test was reasonably hot, so it was a good time to test how the ventilation worked. And we have to say that Bajaj engineers seem to have done quite a good job. Once on the move, there’s plenty of ventilation and even with the windows closed (when trying to record some in-car footage with sound), we were pretty comfortable. The problem is, when you come to a stop, it does start to get stuffy and warm pretty quickly. A point to note is that this was in Pune’s dry climate, where a little breeze is enough to cool you down, even on a hot day. But in a hot and humid place like Mumbai, the Qute maybe a little uncomfortable even on the move. 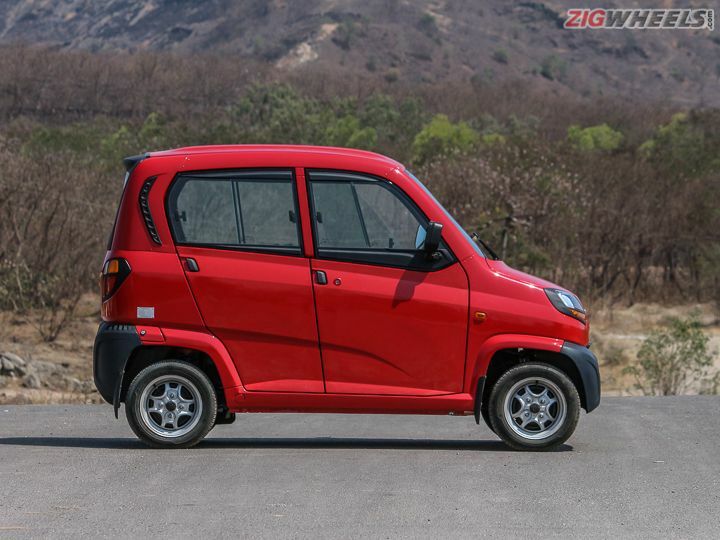 Bajaj says that it is working on a blower solution for the next iteration of the Qute, but in its current configuration, it won’t be making an air-conditioned variant. The Qute is currently available for commercial registration in 20 states and in 15 states, you can even register one as a private vehicle. It falls under the quadricycle rule and requires you to have a four-wheeler licence to drive one. The Qute quadricycle will cost approximately Rs 2.64 lakh for the petrol variant and Rs 2.84 lakh for the CNG variant (both ex-showroom Delhi prices). In comparison, prices for small cars like the Renault Kwid RXE, the entry-level small car variant with an air conditioner, start at Rs 3.1 lakh. Bajaj says that while the asking price is quite close to a regular car (because they can’t compete with better economies of scale that larger car manufacturers have), it says that in the long run, the Qute’s lower running costs will widen the gap. We have to say that it was quite a bit of fun driving around in the Qute in the city. The stability, weather protection and sheer practicality advantage it has over a scooter, motorcycle and even an auto rickshaw is simply undeniable. It’s car-like to drive and is easy to manoeuvre and park as well. But it’s not without a fair share of limitations too. With no ABS or airbags, it’s limited to city roads only and isn’t allowed on highways. The lack of an air conditioner in our tropical climate is another drawback. In the end, we’re not convinced it can replace the family car just yet. Would we prefer hailing one down in the city over autorickshaw though? The answer to that is a most definite “Yes”. Yes I was planning...Since the price is high...I quit.. Yes I was planning...Since the price is high...I quit..